Because there’s so much to discuss here, I’m going to break this up into multiple parts. And in this first part of the series, I’d like to address the fundamental concepts of the sales pipeline and introduce some key points on how to conduct a requirement assessment. The first thing we must understand is what a sales pipeline is all about. According to Selden (1997) a sales pipeline, also known as a sales process, is a “systematic approach to selling a product or service”. Basically we map the sales process, spliting it into stages (or phases) from beginning to end, in order to enable careful analysis (such as risk management and revenue forecast) and continuous improvement. For instance, by defining the sales pipeline and identifying its stages in sales opportunities, we would be able to identify how many opportunities we have in each stage, which salesperson/salesteam is more efficient and so on. For further information on sales pipeline see Wikipedia. Generally speaking there is no right or wrong answer. Every organisation has its own process. However, when implementing the sales process in Dynamics CRM, we might want to reconsider how these stages are going to be mapped in the application, in order to make most of its features. Note: Some of you might be thinking “what if my organisation has different steps for different products/services being sold?” A fair question, but in this case you should always consider your sales pipeline from a macro perspective. No matter if you have a different sales process for apples and oranges, you should map all of your processes into punctual milestone stages (i.e. : your sales pipeline phases), in order to present a strategic “holistic” view of your sales pipeline. Considering the above example for ACME, regardless of the nuances between the sales of apples and oranges, the opportunity will always reach a stage where a proposal is sent, and if things go smoothly, it would eventually progress to the negotiation stage, and so on. Failing to create a holistic sales pipeline would not only be a failure from a management perspective, but your sales pipeline charts and reports within Dynamics CRM would make no sense. In Dynamics CRM, a sale can start with the registration of a Lead. A Lead is a potential client that must be qualified or disqualified as sales opportunities. 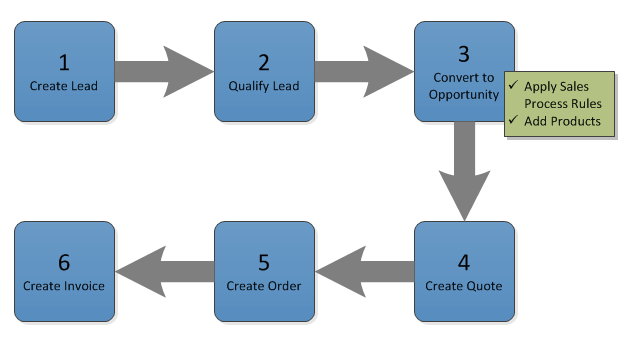 If a lead is qualified, then it can be converted to a sales opportunity and client record (an account and/or contact). Considering this diagram, we can see how the natural progression of a qualified lead is to spawn new records. Looking back at our original sales pipeline, we can conclude that the first stage of our pipeline (Suspect) is handled by the Leads entity within Dynamics CRM. It is not a always that an opportunity is originated from a qualifying lead. For example, an existing client could issue a request for proposal or request a quote to purchase more goods. In which case, a salesperson might register an opportunity directly for the client without the need of first creating a lead. It is important to understand that as soon as an opportunity is marked as won within Dynamics CRM, the opportunity is closed. That means that the opportunity is now outside of the scope of the sales management process and we are now dealing with after-sales activities. Opportunities closed as won don’t show on sales pipeline charts and reports. Looking again at the at our original sales pipeline, we can identify that the Deal stage is when we close the opportunity as won. We can also conclude the the last two stages of our pipeline (Implement and Post Sales) relate to after-sales activities. Therefore from the moment we win a deal, it is beyond the scope of sales. Remember that the Suspect stage is dealt through the Leads entity, and the Implement and Post Sales stages are beyond the scope of a sale. Therefore, in our revised sales pipeline we are left with Prospect, Proposal and Negotiation within the scope of opportunities. Deal is not necessarily a stage in the sales pipeline, but nonetheless it is a milestone. Reaching the Deal milestone means that the deal has been closed and therefore the opportunity is no longer comprising the sales pipeline, but archived as closed with the status reason of won. So let’s now have a look at the at the opportunity entity within Dynamics CRM, which is the main record of our sales process. [single line of text] : Current phase in the sales pipeline for the opportunity. Designed to be updated by using workflows. Process Code [option set] :Customizable code that represents the current stage of an opportunity in a manual sales process. Designed to support manual sales processes upgraded from earlier versions of Microsoft Dynamics CRM. Rating [option set] : Quality of the opportunity, such as hot, warm or cold. Probability (%) [whole number, from 1 to 100] : Likelihood of closing the opportunity. From the four fields mentioned above, two of them are noticed when you open the opportunity form: Rating and Probability (%). The Pipeline Phase field is at the footer of the form, and the Process Code will be manually added into the form in this tutorial. Automated (set indirectly by the user): The opportunity will move forward in the sales pipeline exclusively through the use of workflows as certain criteria in the opportunity record is being met. For example, we could add a field in the opportunity entity where the user specifies a date for when the proposal has been sent. When this field is filled and the opportunity record is saved, the opportunity would automatically move to the Proposal stage. Manual (set directly by the user): With this method, the user specifically sets in the opportunity record which stage of the sales pipeline the opportunity is at. For example, the user could select the stage from an option set. Note: Regardless of the method we use to move through the stages, a workflow is required in order to support the existing sales pipeline report that comes with Dynamics CRM. More on this latter as we move forward. In the case of ACME, they opted to allow users to manually set the stage the sale is at through the use of an option set. For that We will use the Process Code field of the Opportunity entity. A warning on numbering stages: The pipeline funnel chart in Dynamics CRM orders the sequence of stages within the funnel alphabetically. Therefore it is important that we number those in a way that those stages are sorted accordingly in the chart. Numbers (1, 2, 3, …) and letters (a, b, c, …) should be ok. The rating field allow users to select from an option set a value that classifies the opportunity based on the “feeling” of the salesperson. By default, this field has the values of hot, warm and cold. Another important concept we must understand is the likelihood/probability of closing a deal. The further we move through the stages of the sales process the closer we are of a deal. By default, Dynamics CRM allows the use of the Probability (%) field by users where they can type in a percent value (whole numbers from 1 to 100) representing the likelihood of closing the deal. Let’s consider the following scenario, however: What if we want to consider other factors to define the probability? For example, an organisation could consider different probability scales between private sales and public bids, or in the case of ACME, based on the opportunity rating. As an example, if an opportunity is at the stage “2 – Proposal” its rating is set as “warm”, the closing probability for the opportunity would be automatically set at 50%. We now have all the details we need in order to customise Dynamics CRM to meet our requirements. So let’s move on to it. In my next post we will be discussing how to customise the Opportunity entity in order to support the requirements discussed so far. Great series on Sales Pipeline. Would you mind defining a little the stages of "Proposal" and "Negotiation"? Do you recommend setting it to "Proposal" when you have enough opportunity details to work on creating the proposal and then after submitting that proposal to the customer, change the stage to "Negotiating"? That's the way we've sort of interpreted it wanted but to get your thoughts on what's really happening at each stage and what events move it from one stage to the other. fyi, I could not get past your captcha requirements on your Contact Us page. That would be it. Bearing in mind this isn't at all set in stone. Those stages would be defined differently for each Dynamics CRM implementation, depending on the client's business requirements. But you got it right for this example. During the proposal phase you are pretty much developing the proposal. Once the proposal is sent to the client, you would be negotiating the price. Funny about the captcha. I tested and double tested it several times after I implemented. I had to because I was getting a lot of spam.